Should You Leave Your Emotions Out of an Interview? This may sound like a silly question, but, “Should you leave your emotions at home when interviewing?” And more specifically, I’m referring to expressing your emotions at the hopefulness and desire(s) of landing the job. This is why I ask: My best friend interviewed for medical school last week. And getting to this position was no easy feat. She had a trying college experience full of setbacks. One in particular made her medical school dreams seem intangible. One of the main reasons she applied for her undergraduate college of choice was because the school had a great program with a prestigious medical school in the area and the program was designed to help aspiring students enter the medical school in a much smoother (and easier) process. After two years of working hard to join this program, my friend discovered that her school was no longer offering it…just as she was eligible to apply. Then, my friend graduated and took the MCAT, not once but twice. She also took a summer MCAT preparation course to help prepare; all of these undertakings are extremely expensive. Unfortunately, she was rejected from all the schools she applied to. Until, a few weeks ago when this one school in particular contacted her for an interview. Just as my friend had given up hope and was even looking into other career options, this news was like a silver lining in the cloud. What would it mean to your parents if you were accepted into this medical school? And as she began to respond, her emotions set in. She cried, right there in front of the interviewer, as explained her journey and just how significant an acceptance into the program would be for not only her parents, but herself. Now, in my friend’s case, her emotional and honest response did not hinder her as the interviewer told her that, based off of their interview, he believes she would be a great addition to their medical “family.” Yet, her decision led me think about expressing emotions during an interview in general; is this a good or bad idea? 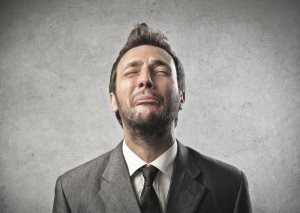 Yes, believe it or not, tough interview questions can make some people cry. When tears flow, the interview is over. No one wants to hire people who can’t control their emotions on the job. I’ve interviewed over 1,000 people during the past 12 years, and in my humble opinion, crying is the kiss of death. I’m a tech professional, so I had a series of interviews with the team I would be working with and my prospective boss, “Jane.” Everything was going well until my final interview, which was with the VP of R&D (Jane’s boss). He apparently did not like my style, because he said that I was coming across as “obnoxious,” that the worst thing to do in job interviews was to annoy the interviewer, and that he was “just telling me this because [I am] early in my career.” (I’m a couple years out of college and in an intermediate level technical position; he has 10-15 more years of experience than I do.) I was horrified and started to cry — I’ve never been more embarrassed — and was flustered and could barely think for the rest of the interview. If you continue reading the post, you’ll discover that despite this person’s emotional display, he or she was still offered the job. Sofia said that no one desires to hire people who can’t control their emotions on the job, and this is probably true. But, I think what makes the difference when it comes to showing emotions in a professional setting is the reason. In my friend’s example, she was genuinely overcome with gratitude for even the consideration of medical school acceptance, a point she’d never believed she would get to. I think it’s normal for anyone who’s been through tough times on the road to pursuing their goals to express emotion when “success” finally comes. And I also believe this “raw” emotional expression shows a level of honesty and genuineness to an interviewer. But, this is my best friend; so, perhaps I’m biased? What are your thoughts? Is it acceptable to express your emotions, particularly tears/crying, during an interview?